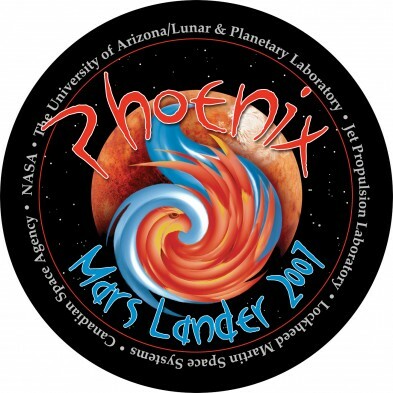 The JPL Press Release, 24 May 2010: PASADENA, Calif. — NASA’s Phoenix Mars Lander has ended operations after repeated attempts to contact the spacecraft were unsuccessful. A new image transmitted by NASA’s Mars Reconnaissance Orbiter shows signs of severe ice damage to the lander’s solar panels. Last week, NASA’s Mars Odyssey orbiter flew over the Phoenix landing site 61 times during a final attempt to communicate with the lander. No transmission from the lander was detected. Phoenix also did not communicate during 150 flights in three earlier listening campaigns this year. Earth-based research continues on discoveries Phoenix made during summer conditions at the far-northern site where it landed May 25, 2008. The solar-powered lander completed its three-month mission and kept working until sunlight waned two months later. Phoenix was not designed to survive the dark, cold, icy winter. However, the slim possibility Phoenix survived could not be eliminated without listening for the lander after abundant sunshine returned. An image of Phoenix taken this month by the High Resolution Imaging Science Experiment, or HiRISE, camera on board the Mars Reconnaissance Orbiter suggests the lander no longer casts shadows the way it did during its working lifetime. 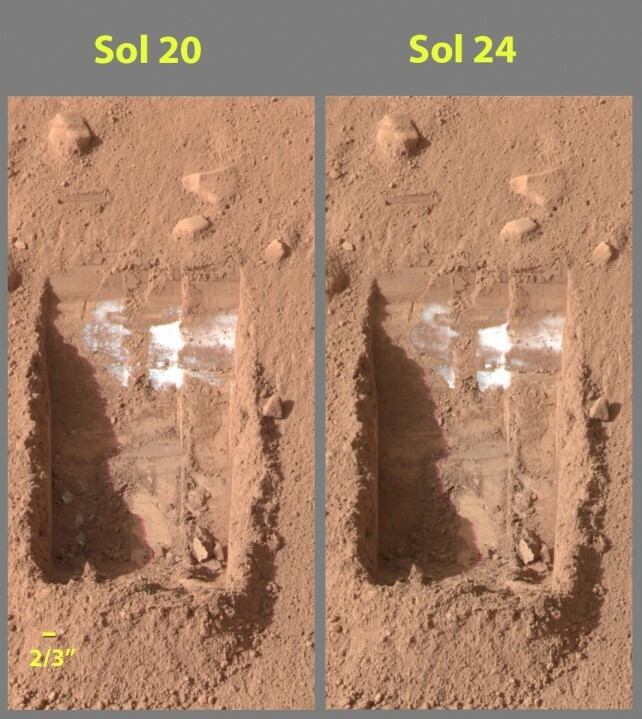 Apparent changes in the shadows cast by the lander are consistent with predictions of how Phoenix could be damaged by harsh winter conditions. It was anticipated that the weight of a carbon-dioxide ice buildup could bend or break the lander’s solar panels. Mellon calculated hundreds of pounds of ice probably coated the lander in mid-winter. During its mission, Phoenix confirmed and examined patches of the widespread deposits of underground water ice detected by Odyssey and identified a mineral called calcium carbonate that suggested occasional presence of thawed water. 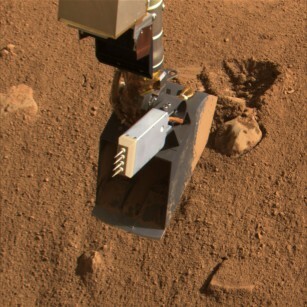 The lander also found soil chemistry with significant implications for life and observed falling snow. The mission’s biggest surprise was the discovery of perchlorate, an oxidizing chemical on Earth that is food for some microbes and potentially toxic for others. 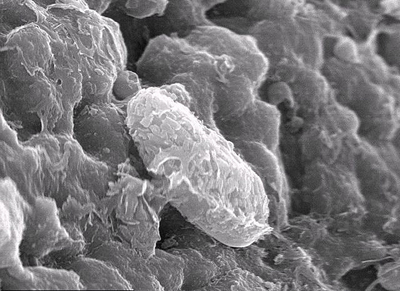 The perchlorate results are shaping subsequent astrobiology research, as scientists investigate the implications of its antifreeze properties and potential use as an energy source by microbes. Discovery of the ice in the uppermost soil by Odyssey pointed the way for Phoenix. 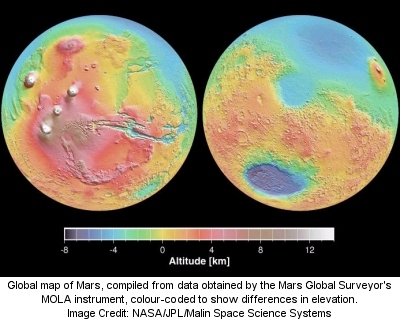 More recently, the Mars Reconnaissance Orbiter detected numerous ice deposits in middle latitudes at greater depth using radar and exposed on the surface by fresh impact craters. We now wait with some impatience for the next mission to cross the great void that separates us from this sister world in hope that from an era of warmer eons, liquid water, and powered by the dynamo of the Sun’s solar engine, that the potential for life was realized. Well done to the thousands whose individual efforts crafted this small but amazing space-faring robot, flung from our own watered world to descend onto Ares’ dry and dusty surface, scraping its frozen crust to reveal the most precious element of life as we know it: plain old frozen water. NO one would have believed in the last years of the nineteenth century that this world was being watched keenly and closely by intelligences greater than man’s and yet as mortal as his own; that as men busied themselves about their various concerns they were scrutinised and studied, perhaps almost as narrowly as a man with a microscope might scrutinise the transient creatures that swarm and multiply in a drop of water. at a much more subtle and cerebral level, “No one would have believed in the last years of the nineteenth century that this world was being watched…” Watched by whom? 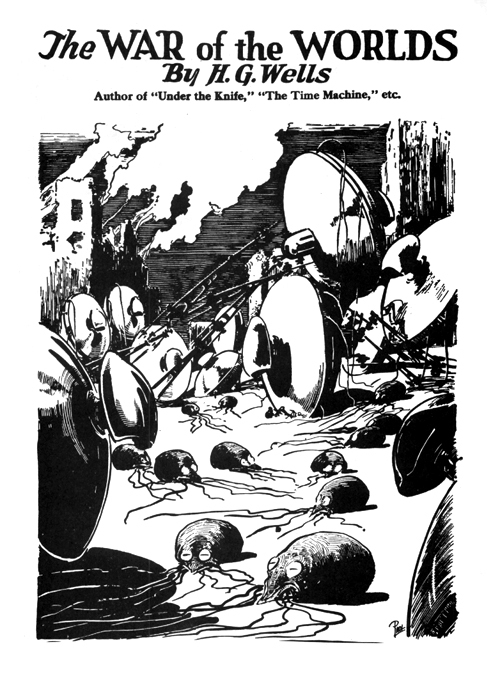 Martians: perhaps the first modern depiction of alien life prescient of the field of astrobiology. Amazingly, many would have believed it; millions did. Mars was the planet of fanciful speculation, with good reason. But I will return to that later. Nevertheless, the universe was still a relatively small and cozy place. Science, as we know it today, was a toddler awkwardly running to and fro, counting and building things. Yet a revolution was brewing, pushed by industry through the 1700s and 1800s, astonishing breakthroughs on how to build things big, how to make an inconceivable jump from the strength and power of humans and beasts to the harnessing of natural elements into machines with the power of a thousand beasts and ten thousand laborers. That however was prelude, for another force was being created and directed, a force that would not only create power but carry information. Though this revolution grew, another vortex formed like a gathering tropical storm, from an unexpected province, not over the consequences of the growing industries that were rapidly building on each step of the toddling sciences, but from the increasing rotation of the storm creating winds and havoc–its target–the very ground and the life that lived upon it: Geology. Biology. Evolution. The age of the earth. The origin of life. Bones, now stone, dug from the ground. Ocean shells on mountain peaks. That confluence of the science of the human mind and the science of the divine mind created a cyclone that like the Great Red spot on far distant Jupiter’s gaseous oceanic atmosphere, has now raged for over a century and a half. As the turmoil over the origin of the world and life raged across the world, something much more quiet and solitary was happening after dark. For 300 years, since a Dutch oculist placed two pieces of curved glass into a tube and realized it could magnify the image at a distance, and soon after an upstart Italian mathematics professor pointed it at the sky, a select group of men, (almost always supported by women, from a sister who was devoted to her brother’s work, to a room filled with highly educated astronomers, but denied access to the telescopes even as these instruments were growing in sophistication), began counting what they saw in the sky. What they saw amazed them. Very slowly it began to dawn upon them that these views of the heavens were going to change the universe in ways so profound that the debate over evolution or divine creation would pale almost to insignificance. Now, if they could just figure out why. In the three decades that followed Wells’ words, Science matured at staggering rate, accomplishing more in those thirty years than perhaps had been achieved in the previous thirty centuries. It is difficult to describe in words the sheer magnitude of the transformation of reality itself. The universe was not small, it was huge beyond comprehension. It was not young but old, so old that nothing in the cherished scriptures of three of the world’s greatest religions gave the slightest hint of that age. And that included an ancient age of the very Earth itself. That was only the beginning of the stunning revelations. As the discoveries of science accelerated through the Twentieth Century, Edwin Hubble in 1929 proved the Milky Way galaxy was but one island universe among, not thousands, but billions, and they were not suspended motionless in the cosmic void, but were moving, and moving at speeds unimaginable previously to any human in history. Away from each other. Which led to only one other even more stunning conclusion: There had been a beginning. But what that beginning looked like was so close to being beyond human comprehension that nearly a century later, millions of people still cannot bring themselves to accept it. It would make no difference though to those who stepped into the staggering reality of the universe. Within that one stupendous century powered flight was invented and human technology leapfrogged from aircraft barely able to climb into the air, to a machine of such great power and thrust, that humans broke the gravitational bonds of Earth. A scant 40 years after Hubble discovered the true nature of the universe, two humans would step upon the surface of Earth’s moon. By the end of the 20th Century, these two stories, one by Dickens and the other by H.G. 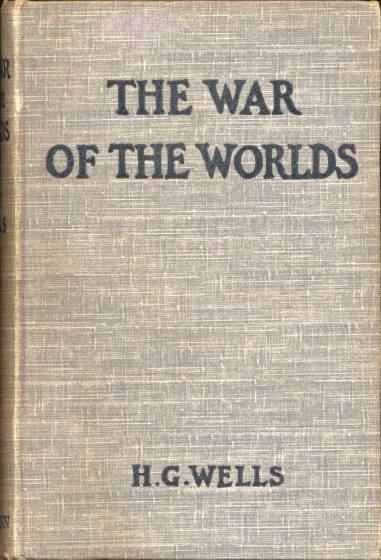 Wells still command the literary attention of the world. At the same time, the two stories of reality, one guided by a devotion to a divinely inspired word, and the other guided by an inspired effort of humans to describe in words what they observed still have not found a way to comfortable accommodate each other, although growing numbers are searching for that integrative spark of the fusion of the two. It is among these seekers that the tale of two planets becomes a revelatory event, a new genesis, indisputable in its truth and its impact. 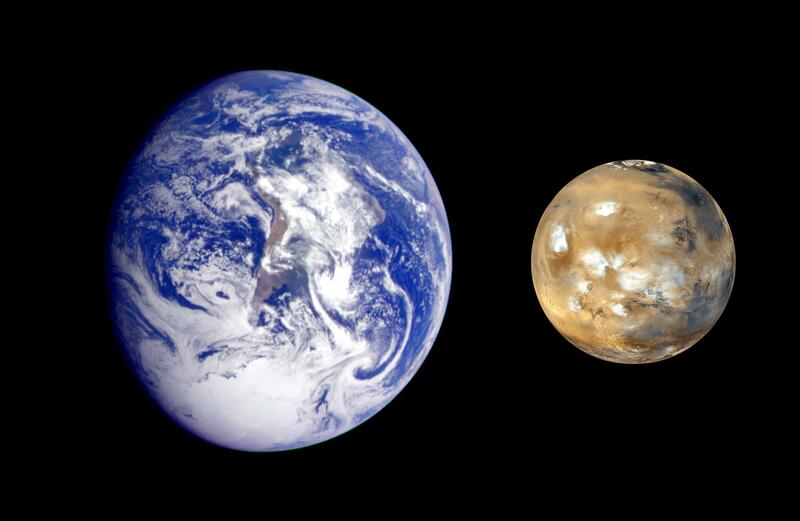 One of the most interesting facts about Mars and Earth is that Mars has almost the same amount of land area as Earth. The difference is that Earth’s oceans cover about 71% of the planet. 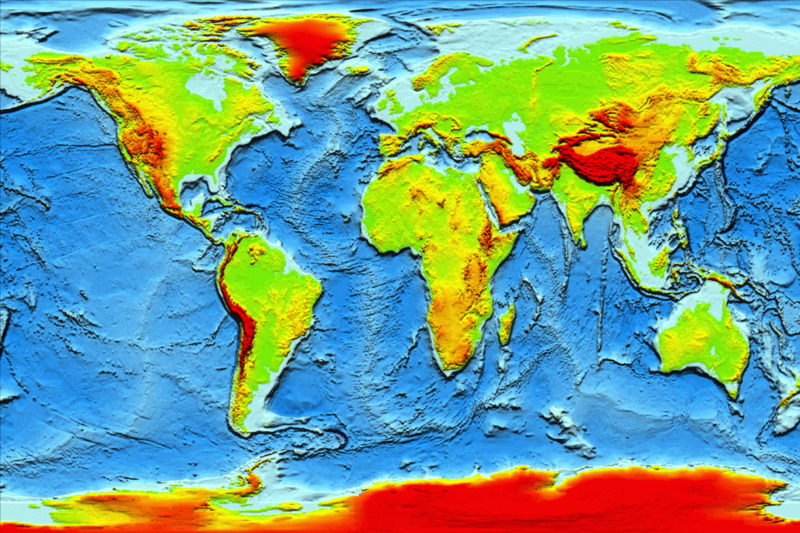 Land accounts for 148.94 million square kilometers on Earth. Mars has 144.80 square kilometers of land. Where, then is the water? 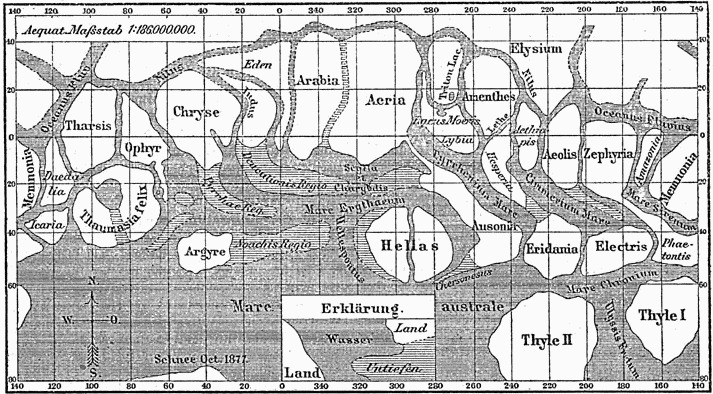 That’s a question that has been relentlessly pursued since, well, Schiaparelli labeled surface details on his map “canale”, which was inaccurately translated into English as “canals” rather than “channels.” Earth-based telescopes could see that the north and south poles of the planet had what appeared to be ice-caps, which grew and shrunk with the seasons (which are about twice as long as Earth’s due to Mar’s orbit being about 80 million km on average farther from the Sun). But was it enough to have once given Mars vital oceans? Those hopes were dashed (though prematurely) when in 1964 NASA’s Mariner 4, the first space probe to make it to Mars sent back pictures of a dry, dead, world. Still, the prospect of a once wetter Mars remained tantalizing. Over the course of the next half century as more robotic missions were flung toward this enigmatic world, the possibility of water, in great quantities continued to lurk just under the surface. The breakthrough finally came in the first decade of the 21st Century, as ever-increasingly sophisticated space probes, some in orbit, some as landers, photographed, radar-probed, scratched the soil, traversed the surface testing thousands of samples of rock and soil. The chemical hints of water were everywhere, but the proof seemingly nowhere. Schiaparelli’s channels were there, as were volcanoes of a height that stunned planetary scientists. 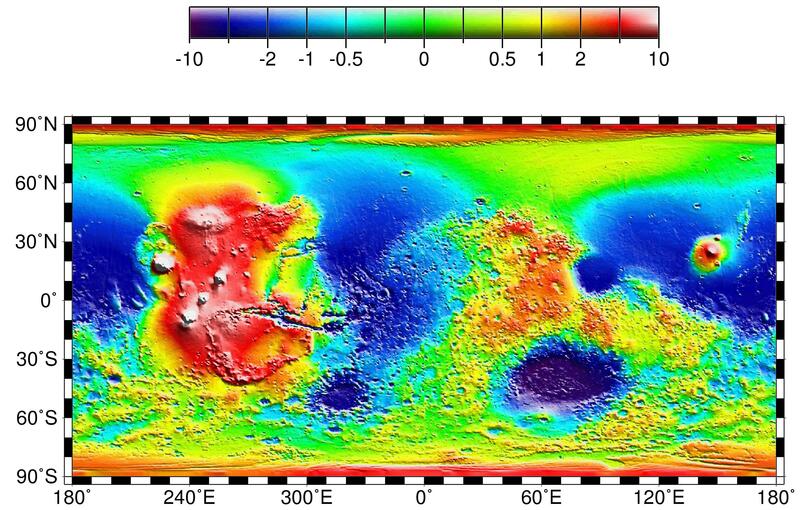 Mars bears the scar of the largest canyon known in the solar system, Valles Marineris, as wide as the continental United States, deeper and wider than the Grand Canyon on a scale so massive as to make the great rift in the Earth look like a scratch by comparison. Ice on the poles was confirmed, too, although the amount of carbon dioxide ice “dry ice” mixed with the water is substantial. Still, the volume of water seemed too small, even accounting for evaporation and sublimation (liquid turning from ice to gas without going through a fluid state). 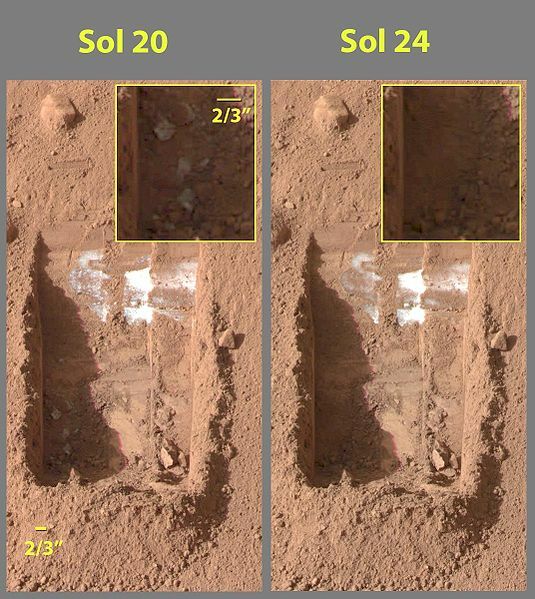 Ice exposed in the trench on Sol 20 (the designation of a day on Mars), had evaporated/sublimated away on Sol 24. 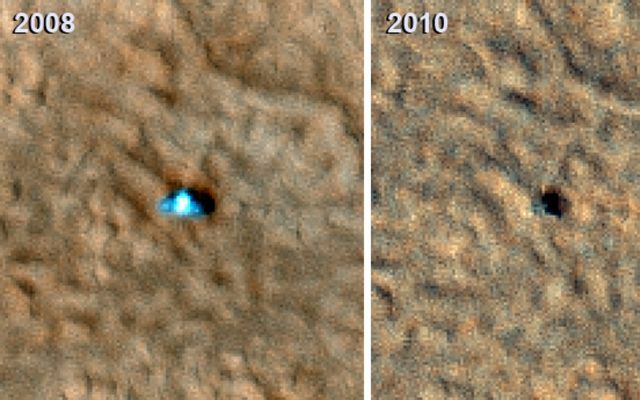 What if the Red Planet had once been the second Blue Planet? And all this brings us to this photo of an unassuming-looking rock. Looks, however can be deceiving, for this rock is a meteorite, and it is from all places, Mars. 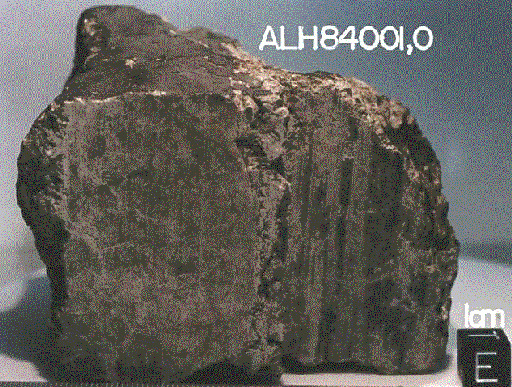 ALH84001,0. A Meteorite from Mars. Discovered: Antarctica, 1984, Wt: 1930.9g, Photo: JSC/NASA. 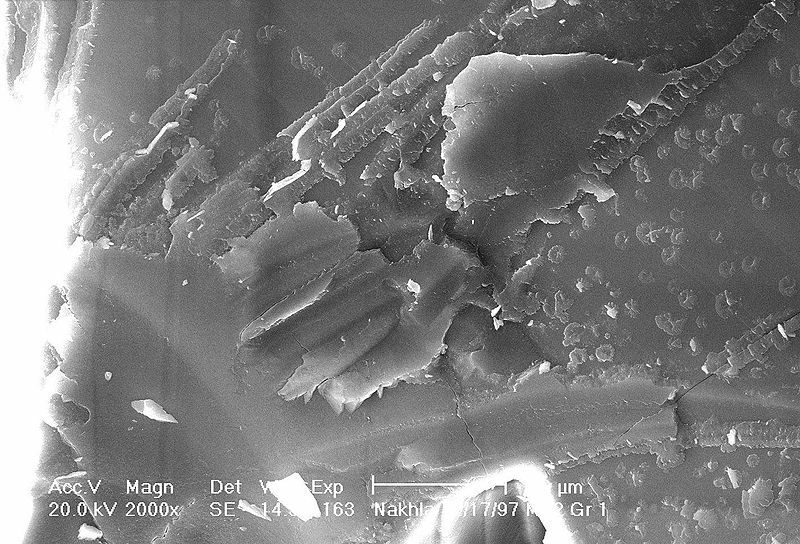 Although meteorites confirmed from Mars are extremely rare (only 12 have been verified), the most astonishing possibility as slices of three of these extraterrestrial rocks were subjected to electron microscopy, structures were present that appeared remarkably like microfossils found in earth rocks. …perhaps almost as narrowly as a man with a microscope might scrutinise the transient creatures that swarm and multiply in a drop of water. We, the humans of Earth are examining the rocks of Mars, scrutinsing them for “transient creatures that swarm and multiply in a drop of water,” even if that drop of water existed billions of years ago. We know we have found Mars’ water. 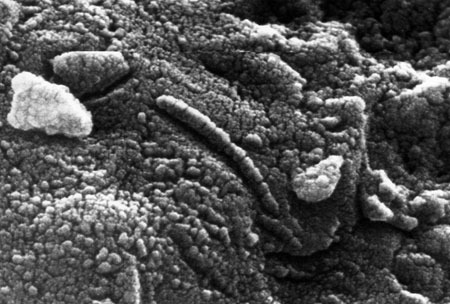 Now, are these structures the remnants of life when Mars was the second blue planet? If that turns out to be the case, the indisputable fact that life existed on both planets, the tale of two planets will require not a new chapter, but whole new book. 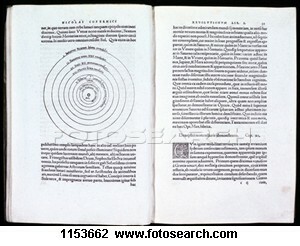 For those who cling to the accounts of the Divine Word as given to a one and only act of creation, from which Homo sapiens sapiens is the capstone of the cosmic plan, they will have to grapple, as never before–regardless of the tirades of the past 150 years–with the realization that the Creator they worship is more clever and speaks with words never heard by human ears, not only on our planetary sibling, but throughout a Universe too large to comprehend, but begging us to do so, nonetheless! 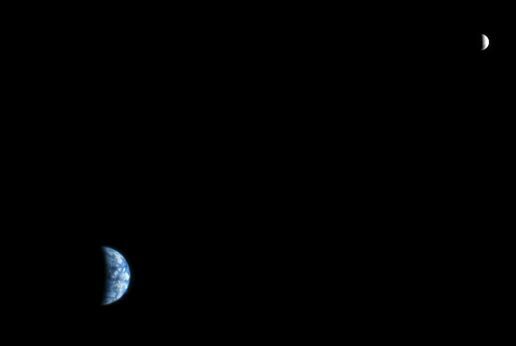 This is the first image ever taken of Earth from the surface of a planet beyond the Moon. 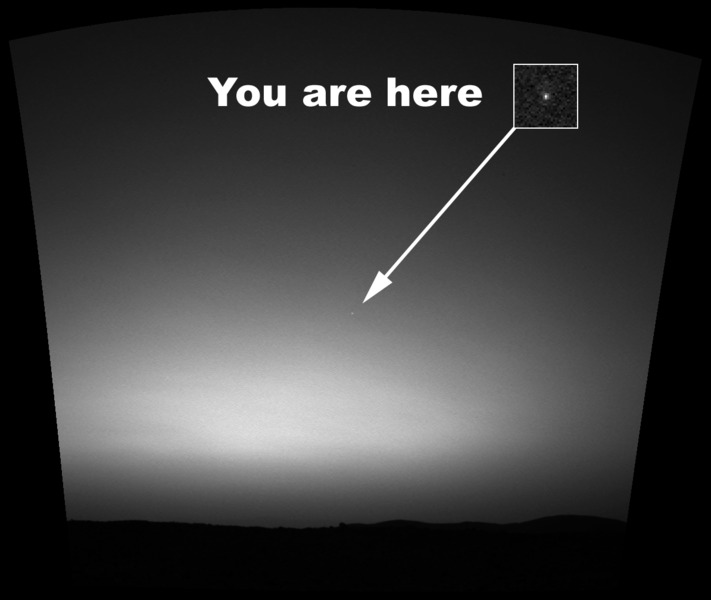 It was taken by the Mars Exploration Rover Spirit one hour before sunrise on the 63rd martian day, or sol, of its mission. The image is a mosaic of images taken by the rover’s navigation camera showing a broad view of the sky, and an image taken by the rover’s panoramic camera of Earth. The contrast in the panoramic camera image was increased two times to make Earth easier to see. The inset shows a combination of four panoramic camera images zoomed in on Earth. The arrow points to Earth. Earth was too faint to be detected in images taken with the panoramic camera’s color filters. Source: NASA. Little did H.G. Wells ever imagine that the first Martian to look at Earth would be through robotic eyes sent from Earth. 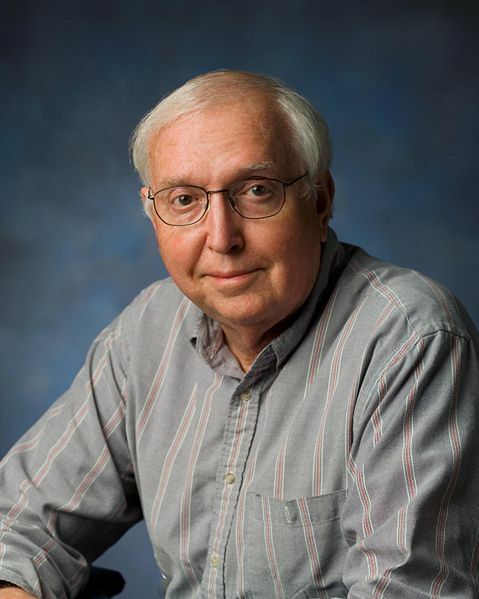 2010–The Year We Learn That Life Beyond Earth Exists? 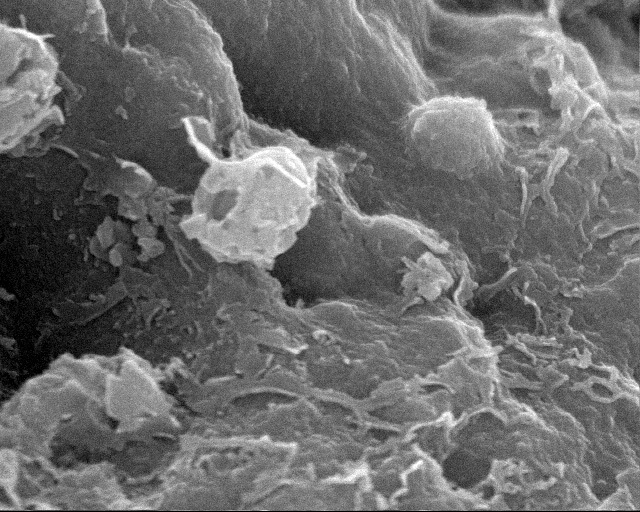 There’s a buzz out there amongst astrobiologists that before this year is out, Dr. David McKay and his research team are going to announce that they have definitively identified fossilized organisms in meteorites from Mars that have been collected on earth. Martian microorganisms. Martians. Real Martians. That bubble of perception that life exists only here on Earth will have been burst. The next step, of course, will be to design Mars missions to determine if any of those organisms have survived Mars’ harsh and extreme history in an environment in which only extremophiles (as we now know flourish on Earth) could survive. That those first missions will be robotic is certain. The opportunity that a human will ever reach down and pick up a rock from the surface of Mars that potentially carries evidence of life living or fossilized in this century, at least under the sponsorship of NASA, appears increasingly doubtful in the current political and geo-centric environment. Although we may be witness to the extinction of the hominid drive to discover the undiscovered, life confirmed beyond the delicate bubble of rock, water and air from which we were formed, literally changes the very quantumization of life itself. It is a change that cannot be undone. From the present into the future, what it means to be living, what it means to be human will be different. For life, as we’ve always known it, no longer requires Earth. There is more, however. All technical considerations aside, if and when this announcement comes, the theological implications, as well as our geo-centric Christology, will no longer be the topic of idle speculation but confront us with a reality that demands a response to the world. Celestial Spheres), we have been attempting to unify our Christology with our Cosmology. The results have been, in my opinion, at best, mixed. 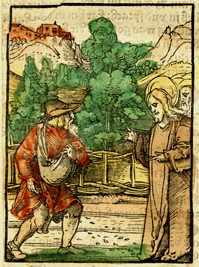 Parable of the Sower, from the Plenarium or the Evangelical Book of the Year, 1516. Basel, Switzerland. Photo: Pitts Theology Library, Emory Univ. The announcement of alien life, even microbial, requires a new conversation with a new set of rules. It shall be a heady time, indeed. Ours is the generation that broke the shackles of gravity and set off across the Solar System. If, too, we are to be ones who confirm that life’s seed has been sown across the expanse of space like the Sower in one of Jesus’ parables, we have much work to do. Looking into the stars that seed the night will never be the same. Ever.